The McCormick Museum was looking for ways to engage local residents in conversations on timely issues affecting its surrounding community. In developing a program, we entered into conversations with the University of Illinois at Chicago’s Institute for Policy and Civic Engagement (IPCE). Together we decided to screen “The Line,” a film exploring the nature and implications of poverty and we invited the Peoples Resource Center (PRC) to participate. The Wheaton-based PRC provides critical services, such as adult literacy, food, and emergency financial assistance to help low income people in their move to self-sufficiency. Both organizations have received support from the McCormick Foundation. We followed the screening with guided conversations about the movie and shared ideas on how participants can engage in the issue. After the event, one participant shared her thoughts about the experience. We’d like to share them with you. 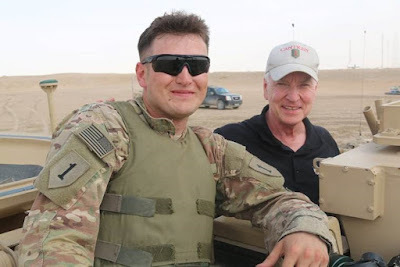 On Sunday, April 3, I attended a free screening of the documentary film “The Line,” hosted by the Robert R. McCormick Museum at Cantigny Park, Peoples Resource Center and the University of Illinois at Chicago’s Institute for Policy and Civic Engagement. The film profiled three individuals: a suddenly unemployed dad from DuPage County, a Chicago woman and mother who lost her job after a life threatening accident, and a Louisiana fisherman who lost his livelihood after the BP gulf oil disaster. Each story captured in a very sensitive way, how suddenly a person’s life can change from one of financial stability to living at or below the poverty line, where overnight you go from a life of relative comfort to constant worry about whether you will have enough to sustain yourself and your family. After the film, we broke into small groups to discuss our reactions, and to think about questions such as, "What is the difference between being poor and being impoverished and, what can be done to eliminate poverty?" My immediate reaction to the film was a sense of vulnerability-the feeling that what happened to the individuals profiled could happen to anyone of us if faced with similar circumstances. While we did not have immediate answers to the questions raised, we agreed that increasing public awareness of poverty in our communities is critical to finding solutions and that poverty is not just someone else’s problem, its ours. We noted that everyone can do a little bit more to help those in need through a small donation or getting involved in one of the many churches and organizations that are dedicated to helping the poor. But what I noticed most was that in a mere two hours, the film and post screening discussion connected people in our community in a new way. I commend the McCormick Museum, Peoples Resource Center and UIC for hosting such a substantive event and thank the McCormick Museum specifically for providing an excellent forum for the exchange of ideas on an important social issue. 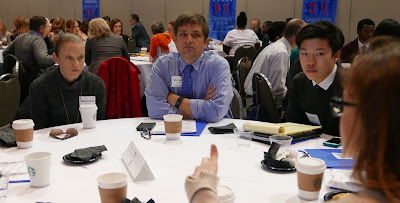 In planning for the 6th annual Illinois Civic Mission Coalition annual convening, I wanted to be intentional with including experiences that would interest a variety of stakeholders that would be in attendance, including teachers and administrators in the Democracy School Network, civic education partners, and students. I especially wanted to engage students with additional leadership roles in the event and to give them a platform to share their perspective on their learning from the event. As we work with schools across the state to strengthen student voice, the convening was a perfect opportunity to also have student voices heard. One of the Illinois State Board of Education (ISBE) Student Advisory Council Members, Chris Kim, accepted my invitation to share his reflection of the event with us. It is a powerful testimonial to the outcomes of strong civic learning experiences in high school and I am excited to share his thoughts with you. This year’s Illinois Civic Mission Coalition Convening continued a great conversation on civic education and the unique ways that young people are entering into this conversation. The first session I attended was the Elections in Action Panel which primarily discussed how to expose students to real world experiences in order to enrich their understanding of civics. The three panelists, including a high school senior from George Westinghouse High School, shared their experiences in engaging students in elections, whether by travelling to the Iowa Caucus, running a mock election, or hosting a complete mock debate. One thing I gleaned from the panel discussion was the need for all parties to be “all in”. Chris Wolak, a social studies teacher at Waubonsie Valley High School, spoke about taking his class to the Iowa Caucus and how none of it could have happened without the collaboration of teachers, administrators, and students. He underscored the role of teachers in providing the “foundation and opportunity” for students and opening the doors not only to an educational experience, but to an empowering application of concepts learned in class. As a student, I immediately identified with the effectiveness of hands on learning as useful for school and life after school. The second session I attended was a panel on teaching controversial current events. Three social studies teachers shared the ways in which their schools and civics classrooms reacted to current and extremely personal events, namely the release of the Laquan McDonald video, the shooting of Michael Brown, and the death of a local police officer. In light of the Laquan McDonald video, teacher Cyriac Mathew from Uplift Community High School shared his goals of opening discussion, making space for emotional processing, connecting the incident to larger issues, and offering hope to his students. I could not help but snap to these goals which not only helped the students to process such injustice in a healthy manner, but also empowered many students to contemplate and stand in solidarity against the larger issues of flawed law enforcement and socioeconomic disparity. One key point that resonated with me from this panel was the importance of bridging civic education with the passions of students. Reaffirming the morning keynote speaker Cathy Cohen from the University of Chicago, I recognized that civics education must account for the lived experience and knowledge of the students in order for it to resonate within them and inspire action.